All-Audio iCritical Care offers access to all of the Society's podcasts. Rated among the top 20 medical podcasts on iTunes, iCritical Care Podcasts are a valuable resource listeners can take anywhere. Subscribe to the iCritical Care All-Audio podcasts on iTunes or Google Play. Don’t forget to rate us and leave comments! 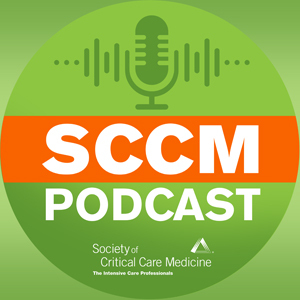 Margaret Parker, MD, MCCM, speaks with Stefanie G. Ames, MD, about the article “Hospital Variation in Risk-Adjusted Pediatric Sepsis Mortality,” published in the May 2018 issue of Pediatric Critical Care Medicine. Dr. Ames discusses study findings regarding the development of a method to evaluate hospital pediatric sepsis performance and how to assess hospital variation in risk-adjusted sepsis mortality in a large state-wide sample. Dr. Ames is a pediatric critical care fellow at the University of Pittsburg School of Medicine in Pittsburg, Pennsylvania. She is working with the Clinical Research Investigation and Systems Modeling of Acute Illness (CRISMA) Center in the department of critical care medicine. Ped Crit Care Med. 2018; 19(5):390-396.